Rebekah has gotten the last five auditions she’s gone on, she’s excited about a short film she recently created and new possibilities are popping up everywhere. It’s almost always like this now. A few days ago Rebekah felt stuck and like things weren’t happening. But she got herself out of it three days by applying the tools she’s learned in The Enchanted Circle and working her trust muscle. This is the quickest she’s ever gotten out of a place that feels less than ideal. In the past she’s stayed there as long as a year. During this interview Rebekah shares how she’s evolved in her 167 days in The Enchanted Circle and how she expects amazing things to happen all the time. Rebekah has been in the Enchanted Circle 111 Days. At the time of this interview, she is counting down to her final hours in Corporate America. Everything in life works out for her. However, 111 days ago, she was at rock bottom. Learn how Rebekah has been living her transition from working full-time to being self employed. Hear how she transitioned and flowed with all that life has thrown her during this shift. Rebekah has “living as if” to make this transition possible. Listen in to hear where she has been putting her energy and focus. Hear about her business and how she will be showing up in the world after these final few days. With 9 years of industry experience working with Authors, public relations and a passion for working with people, Rebekah is confidently stepping into who she wants to be. Listen in to hear her celebration story. At the time this interview was recorded, Rebekah Zink, a millennial who develops award-winning campaigns for authors has been in The Enchanted Circle for 70 days. She is getting ready to leave her job, almost everything on her Manifest $10K list has shown up and she is more confident than she has ever been. It wasn’t always like this. Right before joining The Enchanted Circle, Rebekah was suffering from a lot of things that didn’t feel good. In the interview she says she hit rock bottom. In only 70 days her life has completely changed. Her mindset, abundance and business are all more abundant. Even her mom said she’s different since joining the circle. Rebekah loves being a part of The Enchanted Circle group even though she is very introverted and admittedly doesn’t love group things. Listen to hear more about Rebekah’s growth journey so far and everything that has unfolded. Rebekah Zink is a proud member of the Millennial generation with a BA in Communications and Publicity. She has worked with a long list of award winning authors and has consulted with marketing and media companies to develop ad campaigns aimed at celebrating their individuality. “Life is lighter, more joyful and fun,” says Vanessa when describing her life and business after six months of growing in The Enchanted Circle. Adam says he is less cynical, which makes all the difference in the way he looks at things in life and business. Over the past six months, as a couple they have manifested over $67,505 and off of it was done with more play and more sweetness. Things weren't always this way. Listen in to hear how this amazing couple has shifted together. Adam and Vanessa are the owners of Bee The Wellness, a wellness company with a focus towards adventure travel. They help people create systems for better health, well - being, and adventure in their lives. Adam and Vanessa of Bee The Wellness interview Manifestation Coach Cassie Parks. Tell us about the moment that you realized you had control over your abundance story? What is the process for creating your programs? Divine download or is it a more methodical process? In previous interviews and conversations, we’ve talked about how the work works but it always depends on how open the student is to the information and coaching? Can you explain? What the single most important thing that someone could “get” to start the cascade of change in their abundance story? After all the years of coaching and helping people establish different habits what is the one thing you do every day to keep your mindset abundant? How can people get started today changing their abundance story? Adam and Vanessa Lambert are the powerhouse couple who support the health and growth of others at Bee The Wellness. At the time of this interview they had been participating in The Enchanted Circle for about four months. Vanessa says the biggest thing doing this work together has done is get them on the same page quickly and easily. It has given them a common language to grow and move their business forward with. The biggest growth for Adam has been opening to allowing things to happen rather than forcing them to happen. Both of them have experienced a shift in how many hours they feel like they should be putting into their business in order to be successful. This has given them time to enjoy their lives more, which is why they started their businesses to begin with. One of the things that has happened since they are moving away from forcing and more into allowing is that their are allowing the space for the next big thing in their business to evolve. This has allowed them to push less. They are moving forward with what they are feeling certain of and allowing the rest to unfold. One of the things Adam has realized is they have as much done as they would have pushed but it feels a lot better. In this interview we also talk about how the RV they took to Burning Man showed up in the nick of time and how everything worked out perfectly to allow them to take it on their trip. Listen to hear all the juicy details. At the time of this interview Adam and Vanessa have been in The Enchanted Circle for 78 days. They just finished the biggest Bee Fest ever (2018)! In this interview Vanessa talks about letting of an old habit of leaving things to the last minute to get stressed out. Doing this allowed her to be fully present at the event and enjoy it so much more. Adam talks about what it’s been like to be out of his job for 28+ days which is the most he’s ever not worked. He talks about the adjustment and the freedom it’s created in his life. Vanessa and Adam also share how important it has been that they have been participating in Manifest $10K and receiving coaching together. It has allowed them to get out of “freak-outs” quicking rather than retreating which has always been the pattern. They discuss how having access to the same tools helps them stay calm and start moving forward again quickly. We also talked about what it means to be coachable and how being coachable gets you more of what you want faster. Adam and Vanessa run a successful adventure travel and badass lifestyle company, Bee the Wellness. The inspiration hit Vanessa six years ago and they took everything online four years ago. Their business is successful but they joined The Enchanted Circle to take it to the next level. Adam is also getting ready to release his job. Both Adam and Vanessa have been dedicated to their self-development journey for a long time and they are still finding ways that their money stories have been impacting their experience. Kate from K84wellness.com interviews Law of Attraction Coach Cassie Parks about manifesting. What is your first thought in your head when you wake? What does your day look like when you wake up? Do you have a ritual? How long did it take you to figure this ritual out or did it evolve? What are your favorite LOA tools? Explain LOA - why does it work? in what areas does it work? What's the process to correct your thoughts? Where would one start with building their trust muscle? Is Karma a LOA term? How many motivational seminars and self help books did you read/attend? If you are not sure of your action and you do it anyway, will you end up on the same path as you would have? If you were to put LOA in steps, what would that look like? Kate Cretsinger is the Founder and Owner of K8 4 Wellness. She is the mother of 2 beautiful young adults. She graduated from University of New England with a Bachelor of Science degree in Exercise Science, and became certified as a Nutrition Coach by the Institute for Integrative Nutrition in 2015 to overcome her own health complications. She has over 15 years of experience in the health & wellness field as a personal trainer, instructor and nutrition coach. Today during a coaching session it became clear that in four months (March 2019) Kate will be three months ahead in her business income. And in April (2019) she will making enough to start investing in things that six months ago were just a dream, like paying half of her household expenses. By Budgeting for Attraction and writing a new money story, Kate has been able to create a new experience where at the end of each month she has more than enough money. So much more, that she’ll have a three month cushion by April 2019. 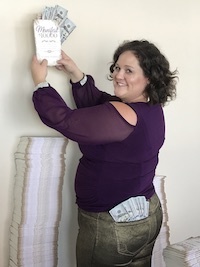 It wasn’t always like this, four months ago Kate was amazing at manifesting money but her money story (Survival) caused her to hot potatoe her money (get rid of it so she was in survival mode) and put her in a position of having to borrow money. At the time of this interview Kate has been in The Enchanted Circle for 231 days and has been doing monthly one-on-one sessions with Cassie for five months. Kate’s life is awesome. She was recently inspired to increase the investment to work with her (raise her prices) in her online program and she had two new clients enroll. Last month she had more than enough to cover her monthly investments (expenses) for the first time and an opportunity to add to her business and increase her revenue in an easy way just fell into her lap. Additionally, Kate is now Budgeting for Attraction, which is supporting her increasing her business revenue and allowing her to allocate money for the things she wants to invest her money in, cool upgrades to her truck, a new Future Self wardrobe and savings for a new home. Kate’s former money story was Survival, so Budgeting for Attraction has brought awareness to times when she is trying to keep herself in survival mode by buying food when she doesn’t need it. She’s been able to justify her extra investments in food because she is a health coach. But now that she is aware she’s about to stop the behavior and don’t worry she’s not going hungry. She’s simply making the choice to not double spend on the exact same food. Listen to hear all about Kate’s inspired action to drive for Uber and how that energy attracted the new opportunity to make more money even easier as well as all the other good stuff mentioned above. Kate manifested $3630.05 in the last week, by attracting new clients and finding money. That brings her total manifested to $33,661.89 in the 140 days she has been a part of The Enchanted Circle. The coolest part of this is that she manifested more than 10% of her total the last week. That means momentum is building and Kate is getting better and better at manifesting. Does that mean everything is always awesome? No, last week was rough for Kate. Even though she has been manifesting more money than ever during the last 140 days she is still writing a new money story. Which means her old money story Survival has been taking over and Kate found herself in a financial position that was less than ideal. In this interview Kate shares how she turned that around quickly, manifested more than $3600 and now has a plan to utilize this new money to write a really good new money story. This is all part of the process. Writing a new money story involves manifesting more money and then doing different things with it. Kate is right on track and now has more than half of next month’s business investments, including paying herself. During this interview we talked about how this week Kate is experiencing what it’s like to make $189,000/year. Listen to hear all about how Kate manifested more than $3600 in a week and how she is writing the best money story possible. At the time of this interview, Kate has had ten people who have already paid her or want to become her client in the last 48 hours or so. In a normal week should would attract one new client. What changed in the last 48 hours to turn up Kate’s attraction factor? She did! Kate got on a plane about 48 hours ago and flew to Denver for a celebration cocktail party with myself and a few other Enchanted Circle members. What’s awesome for Kate, who at the time of this interview has been in The Enchanted Circle for 75 days is that she started moving her business online and already has three people registered for her first course. That’s because Kate had a version of who she thought her Future Self was and as she was guided through the workshop she discovered a much deeper, bigger version of her Future Self. She also realized how her scripting had been missing the mark. During the workshop Kate also took a huge leap into her Future Self by booking a trip to visit Denver for celebration cocktails. Listen to hear how having made this big decision is helping her to recognize the difference between her current and Future Self. At the time of this interview Kate has manifested $9,851.93. Clients are finding her via her website and she loves the current group she’s working with. Everything is easy. It wasn’t always like this. Kate’s first year as a Certified Nutrition Coach was a good one, but prior to joining The Enchanted Circle she felt like she was working harder to make the same amount of money. Kate heard Ginny (the co-host of Manifest It Now) on another podcast and stopped the recording immediately to go listen. After binging on Manifest It Now, she started listening to More Money and felt like everything Cassie was saying was where she was at. She bought four of Cassie’s books and read them in as many days. But she felt overwhelmed. She wanted to do them all, but wasn’t sure where to start. So, she joined The Enchanted Circle and has seen tremendous changes so far. During that time Kate has experience the value of being in a supportive group and being in a place where she, being a coach, can show up and just be and receive the support she desires to create the life and business she desires. When Kate showed up to The Enchanted Circle she was scripting on her own. Cassie asked her to press pause on that and focus on completing Manifest $10K. When Kate did that, new possibilities opened and clients she loved started showing up. Kate is trained in sales so the biggest lesson so far has been to let that go and not force anything. Kate is the Founder and Owner of K8 4 Wellness. She is the mother of 2 beautiful young adults. She graduated from University of New England with a Bachelor of Science degree in Exercise Science, and became certified as a Nutrition Coach by the Institute for Integrative Nutrition in 2015 to overcome her own health complications. She has over 15 years of experience in the health & wellness field as a personal trainer, instructor and nutrition coach. Michele is a self-employed Mompreneur who lives in her dream home, her car is paid off and she has money in the bank. Not only is Michele happy but she is setting up her life where she can always support herself. The clients she needs are calling her. The best part about this is today is Michele’s one year anniversary of being a single mom. Over the last year she has gotten clear about the life she wants to be living. It wasn’t always this way. Michele’s former money story is Survival. She would spend her money in excess to create a situation she had to fix. You’ll hear how she has done some things to support her new money story like pay her bills before they are due, put eating out and grocery money in envelopes and create a budget for attraction. Living her life as her future self is helping Michele see all the connections to habits that have linked to her former money story. We are changing those every day by creating new money habits. Michele is on a mission to be focus on where she is going and creating the life she loves including hobbies like travel, cycling, keto cooking while living out her future life with optimal health, wealth and time freedom. It is 2019! Happy New Year! Listen in as Law of Attraction Coach, Cassie Parks shares how to make the law of attraction work for you, help you hit your new year's resolutions and continue to grow this year.